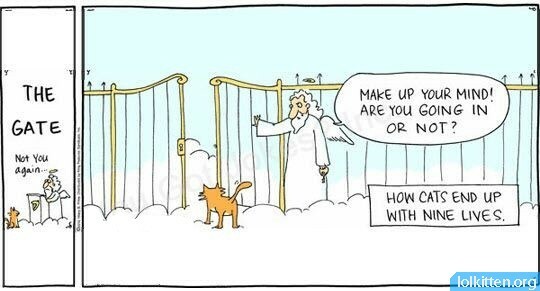 There are reasons why people say cats have nine lives. Just ask any cat owner if they have a tale about how their feline got into trouble and survived multiple times. “First, it’s pretty clear it would have to be one of the many numbers that has traditional significance in Western culture, of which nine is among the most resonant. “Second, while seven, for example, is almost always positive and 13 is almost always negative, nine can have both positive and negative connotations: for example, cloud nine versus the nine rivers of hell. 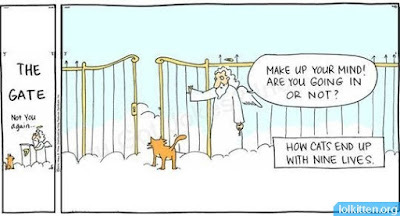 I think this may reflect our ambivalent cultural attitude towards cats. At a very early age my mother made me go under the house to “rescue” our cat Tiger, an enormous orange tabby with an attitude, when he was fighting with another feline. This happened more times than I care to think about. I remember their glowing eyes and high pitched screeches practically paralyzed me as I crawled around trying to “rescue” that red devil! Don’t get me wrong. I love cats. Asia, a Siamese, was one of my wife, two sons, and my favorite. He lived 19 years before we had to put him down because of numerous health problems. When we lived in 29 Palms, Asia was attacked by a pack of coyotes. Somehow, he got outside when we went to bed (we were always careful to make sure he was inside as we knew coyotes were plentiful) and ran into a vicious pack of nocturnal desert predators. My wife woke up when she heard “yipping” sounds outside our bedroom. She glanced out the window, opened the closet and grabbed my shotgun - sans ammo - because she couldn’t reach high enough to get it, and charged outside screaming at the top of her lungs. I followed. The coyotes were playing a game of hot potato with Asia. They were so startled they dropped him and ran away. We gently picked him up (he was in shock), and ran the to the local veterinarian’s house and woke him up. He put in more than one hundred stitches and told us it didn’t look good for Asia. We took Asia home, and after a couple of days he started eating and drinking again. One life less, he recovered and moved on. There was another situation, while we lived in La Quinta (another happy hunting ground for coyotes), when Asia got out and disappeared for several days. Our whole family was heartbroken. We figured he'd used up his mythical nine lives. Then one night at 3:00 a.m. my wife heard a scratching and familiar meow. She got up and let Asia in, none the worse for wear. Her happy voice greeting Asia woke the rest of us and we all danced around the house like idiots! That was 30 years ago. Today we have three cats; Tommy, Oliver, and Bob. Oh yeah...and a pug too!